The brief for this design competition was to create an iconic bus shelter and canopy entrance encompassing both the heritage character of North Sydney and progressive, sustainable design. Referencing the heritage bus shelter, our design unfolds a hipped roof to investigate its inherent original geometry. This unfolding reveals a ‘net’ structure, creating the opportunity to form a unique and relevant language for the new bus shelter form. 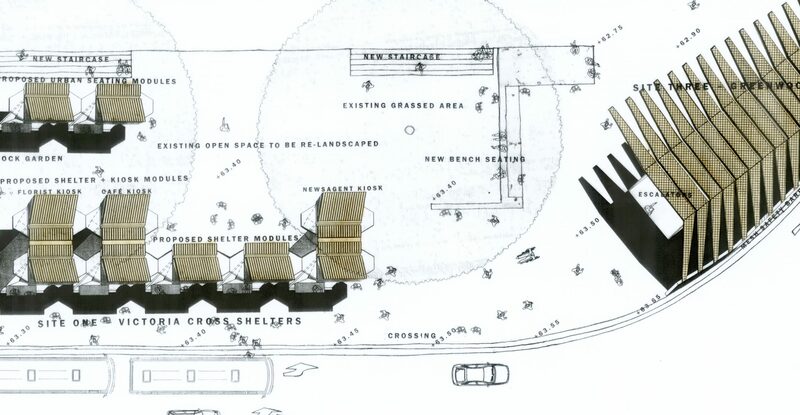 Beyond the functional form of a bus shelter, the design seeks a visual and physical permeability through the site. By separating, augmenting or consolidating different pathways, these sheltering kiosks are linked and extended to the aesthetic in the canopy over the Greenwood Plaza / North Sydney Station underpass entrance.